A spider uses up to seven different types of silk, all having specific functions, as building material, weapon, and sensory organ to detect the presence of preys on its web. Recently, scientists have put under the limelight the extraordinary properties of this ancient material. Indeed, native silk, directly extracted from spiders, is a tough, biodegradable, and biocompatible thread used mainly for tissue engineering and textile applications. Blessed with outstanding optical properties, this protein strand can also be used as a bioresorbable optical fiber and is, moreover, intrinsically sensitive to chemical compounds. In this communication, the waveguiding properties of native dragline silk are assessed and a pioneering proof-of-concept experiment using pristine spider silk as an optical fiber to measure humidity content is demonstrated. The feasibility of using silk-based optical fiber chemical sensors is also discussed. L. Thévenaz, “Next generation of optical fibre sensors: New concepts and perspectives,” Proc. SPIE, vol. 9157, pp. 9157AN-1–9157AN-4, 2014. X.-D. Wang and O. S. Wolfbeis, “Fiber-optic chemical sensors and biosensors (2013–2015),” Analytical Chem., vol. 88, no. 1, pp. 203–227, 2015. B. Kuswandi, R. Andres, and R. Narayanaswamy, “Optical fibre biosensors based on immobilised enzymes,” Analyst, vol. 126, no. 8, pp. 1469–1491, 2001. Y. Antman, A. Clain, Y. London, and A. Zadok, “Optomechanical sensing of liquids outside standard fibers using forward stimulated brillouin scattering,” Optica, vol. 3, no. 5, pp. 510–516, 2016. T. Yeo, T. Sun, K. Grattan, D. Parry, R. Lade, and B. Powell, “Characterisation of a polymer-coated fibre Bragg grating sensor for relative humidity sensing,” Sens. Actuators B, Chem., vol. 110, no. 1, pp. 148–156, 2005. A. Hassani and M. Skorobogatiy, “Design of the microstructured optical fiber-based surface plasmon resonance sensors with enhanced microfluidics,” Opt. Exp., vol. 14, no. 24, pp. 11616–11621, 2006. Y. Koike and K. Koike, “Progress in low-loss and high-bandwidth plastic optical fibers,” J. Polymer Sci. Part B, Polymer Phys., vol. 49, no. 1, pp. 2–17, 2011. W. Zhang and D. J. Webb, “Humidity responsivity of poly (methyl methacrylate)-based optical fiber Bragg grating sensors,” Opt. Lett., vol. 39, no. 10, pp. 3026–3029, 2014. D. E. Meyer, “Miniature moisture sensors for in-package use by the microelectronics industry,” in Proc. 1975 13th Annu. Rel. Phys. Symp., 1975, pp. 48–52. A. Dér, S. Valkai, A. Mathesz, I. Andó, E. K. Wolff, and P. Ormos, “Protein-based all-optical sensor device,” Sens. Actuators B, Chem., vol. 151, no. 1, pp. 26–29, 2010. L. Fábiánet al., “Protein-based ultrafast photonic switching,” Opt. Exp., vol. 19, no. 20, pp. 18861–18870, 2011. A. Matheszet al., “Integrated optical biosensor for rapid detection of bacteria,” Optofluidics, Microfluidics Nanofluidics, vol. 2, no. 1, pp. 15–21, 2015. C. Müller, M. Hamedi, R. Karlsson, R. Jansson, R. Marcilla, and O. Inganäs, “Woven electrochemical transistors on silk fibers,” Adv. Mater., vol. 23, no. 7, pp. 898–901, 2011. J. Gosline, P. Guerette, C. Ortlepp, and K. Savage, “The mechanical design of spider silks: From fibroin sequence to mechanical function,” J. Exp. Biol., vol. 202, no. 23, pp. 3295–3303, 1999. F. Vollrath and D. P. Knight, “Liquid crystalline spinning of spider silk,” Nature, vol. 410, no. 6828, pp. 541–548, 2001. H. Wendtet al., “Artificial skin–culturing of different skin cell lines for generating an artificial skin substitute on cross-weaved spider silk fibres,” PloS One, vol. 6, no. 7, p. e21833, 2011. P. Domachuk, H. Perry, J. J. Amsden, D. L. Kaplan, and F. G. Omenetto, “Bioactive self-sensing optical systems,” Appl. Phys. Lett., vol. 95, no. 25, p. 253702, 2009. F. G. Omenetto and D. L. Kaplan, “A new route for silk,” Nature Photon., vol. 2, no. 11, pp. 641–643, 2008. V. M. Swinerd, A. M. Collins, N. J. Skaer, T. Gheysens, and S. Mann, “Silk inverse opals from template-directed β-sheet transformation of regenerated silk fibroin,” Soft Matter, vol. 3, no. 11, pp. 1377–1380, 2007. R. Capelliet al., “Integration of silk protein in organic and light-emitting transistors,” Organic Electron., vol. 12, no. 7, pp. 1146–1151, 2011. S. Toffaninet al., “Low-threshold blue lasing from silk fibroin thin films,” Appl. Phys. Lett., vol. 101, no. 9, p. 091110, 2012. R. R. da Silvaet al., “Silk fibroin biopolymer films as efficient hosts for DFB laser operation,” J. Mater. Chem. C, vol. 1, no. 43, pp. 7181–7190, 2013. M. B. Applegate, G. Perotto, D. L. Kaplan, and F. G. Omenetto, “Biocompatible silk step-index optical waveguides,” Biomed. Opt. Exp., vol. 6, no. 11, pp. 4221–4227, 2015. S. Kujala, A. Mannila, L. Karvonen, K. Kieu, and Z. Sun, “Natural silk as a photonics component: A study on its light guiding and nonlinear optical properties,” Sci. Rep., vol. 6, 2016, Art. no. .
N. Hubyet al., “Native spider silk as a biological optical fiber,” Appl. Phys. Lett., vol. 102, no. 12, p. 123702, 2013. K. H. Tow, D. M. Chow, F. Vollrath, I. Dicaire, T. Gheysens, and L. Thévenaz, “Towards a new generation of fibre-optic chemical sensors based on spider silk threads,” in Proc. 2017 25th Opt. Fiber Sens. Conf., 2017, pp. 1–4. C. Y. Hayashi and R. V. Lewis, “Molecular architecture and evolution of a modular spider silk protein gene,” Science, vol. 287, no. 5457, pp. 1477–1479, 2000. K. Mita, S. Ichimura, and T. C. James, “Highly repetitive structure and its organization of the silk fibroin gene,” J. Mol. Evol., vol. 38, no. 6, pp. 583–592, 1994. Z. Shao and F. Vollrath, “Materials: Surprising strength of silkworm silk,” Nature, vol. 418, no. 6899, pp. 741–741, 2002. B. Madsen, Z. Z. Shao, and F. Vollrath, “Variability in the mechanical properties of spider silks on three levels: Interspecific, intraspecific and intraindividual,” Int. J. Biolog. Macromol., vol. 24, no. 2, pp. 301–306, 1999. C. Holland, K. O'Neil, F. Vollrath, and C. Dicko, “Distinct structural and optical regimes in natural silk spinning,” Biopolymers, vol. 97, no. 6, pp. 368–373, 2012. F. Paquet-Mercier, T. Lefèvre, M. Auger, and M. Pézolet, “Evidence by infrared spectroscopy of the presence of two types of β-sheets in major ampullate spider silk and silkworm silk,” Soft Matter, vol. 9, no. 1, pp. 208–215, 2013. D. J. Little and D. M. Kane, “Image contrast immersion method for measuring refractive index applied to spider silks,” Opt. Exp., vol. 19, no. 20, pp. 19182–19189, 2011. Y. Okamura, S. Yoshinaka, and S. Yamamoto, “Measuring mode propagation losses of integrated optical waveguides: A simple method,” Appl. Opt., vol. 22, no. 23, pp. 3892–3894, 1983. 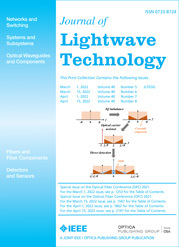 K. Kikuchi and T. Okoshi, “Wavelength-sweeping technique for measuring the beat length of linearly birefringent optical fibers,” Opt. Lett., vol. 8, no. 2, pp. 122–123, 1983. Z. Shao and F. Vollrath, “The effect of solvents on the contraction and mechanical properties of spider silk,” Polymer, vol. 40, no. 7, pp. 1799–1806, 1999. K. H. Tow, D. M. Chow, F. Vollrath, I. Dicaire, T. Gheysens, and L. Thévenaz, “Spider silk: A novel optical fibre for biochemical sensing,” in Proc. Int. Conf. Opt. Fibre Sens., 2015, pp. 96347-D1–96347-D4. J. Guan, F. Vollrath, and D. Porter, “Two mechanisms for supercontraction in nephila spider dragline silk,” Biomacromolecules, vol. 12, no. 11, pp. 4030–4035, 2011. T. A. Blackledgeet al., “How super is supercontraction? Persistent versus cyclic responses to humidity in spider dragline silk,” J. Exp. Biol., vol. 212, no. 13, pp. 1981–1989, 2009. C. Wang and P. Sahay, “Breath analysis using laser spectroscopic techniques: Breath biomarkers, spectral fingerprints, and detection limits,” Sensors, vol. 9, no. 10, pp. 8230–8262, 2009. T. Yeo, T. Sun, and K. Grattan, “Fibre-optic sensor technologies for humidity and moisture measurement,” Sens. Actuators A, Phys., vol. 144, no. 2, pp. 280–295, 2008. T. Lefèvre, F. Paquet-Mercier, J.-F. Rioux-Dubé, and M. Pézolet, “Structure of silk by Raman spectromicroscopy: From the spinning glands to the fibers,” Biopolymers, vol. 97, no. 6, pp. 322–336, 2012. A. Rising and J. Johansson, “Toward spinning artificial spider silk,” Nature Chem. Biol., vol. 11, no. 5, pp. 309–315, 2015.